It’s official. Raleigh, N.C., has one of the most exciting and fastest-growing restaurant and bar scenes in the Southeast. Here are four stellar new additions that appear destined to become local favorites. “Raising the bar” is a term being used to describe Standard Foods, the restaurant/grocery store hybrid recently introduced by former Herons at The Umstead Hotel and Spa executive chef and James Beard Award nominee Scott Crawford. Standard Foods is located in Person Street Plaza, the retail development at Person and Franklin Sts. in the red-hot Mordecai district. The 80-seat restaurant will showcase a fiercely-authentic Southern style, with the bold original touches Crawford is recognized for. Think rabbit, duck and heritage (non-factory) pork. You’ll find a full dinner menu (lunch is on the way), plus prepared foods and a grocery/pantry that will set foodies and locavores atingle. In addition to vigilantly-sourced local produce, milled corn, wheat and other provisions, a whole animal butchery will render a selection of cured, smoked and fresh meats. Look for native N.C. shellfish and seafood, whole house-smoked fish, braised meats, house-made stocks and sauces, un-homogenized milk, cream, buttermilk and cheeses from across the South. Craft cocktails, together with N.C. beers and wines curated by master sommelier Fred Dexheimer, will be a focus of the bar. Consider it raised. Next door to Second Empire Restaurant & Tavern on Hillsborough St., the new Taverna Agora has quietly emerged as one of the most delightful and welcome additions to the downtown Raleigh dining scene. If you haven’t noticed while driving by, it has a rooftop bar and dining space that just may be the coolest spot in town. There’s also an open-air front “porch” which gives the main dining room on the ground floor even more ambiance. If you were a fan of the original location in Oak Park on Glenwood North, you’ll recognize many of the Greek bistro classics: fried zucchini, the pork chop stuffed with garlic, spinach and feta and finished with rosemary aioli, Athenian chicken and the Traditional Sampler—stuffed grape leaves, pita and tzatziki, spanikopita (spinach pie) and tiropita (cheese pie). The Agora lunch platter with pork souvlaki, Greek village salad and Taverna fries remains a favorite. Taverna Agora is perfect for special occasions or just a casual night out with friends. But make a reservation—the word is out. Across from Taverna Agora at the corner of Hillsborough and Harrington is State of Beer, a cubbyhole of cool brought to you by the team behind Busy Bee Cafe and that other hip hideaway, Trophy Brewing Company. State of Beer is a bottle shop/sandwich shop mash-up serving outstanding sammies, salads, cheese and charcuterie and, on occasion, some of the best bahn mi in Raleigh. The bottle selection, as well as the drafts on tap, is impressive for its originality. No strip mall beer shop, this. Grab a cold one and enjoy a ghost pepper salami sandwich while the staff spins some old-school vinyl on the turntable. There’s also great seating outside if you care to add the sights and sounds of the capital city to the mix. Meanwhile, Glenwood South impresario Niall Hanley (Solas Restaurant Lounge & Roof, Hibernian Restaurant & Pub) has delivered his latest masterwork, Raleigh Beer Garden (pictured above), a three-story craft beer and cocktail wonderland that is already making national headlines for having more beers on tap–366–than any other location on earth. Yes, Hanley is applying for the Guinness (of course) World Record. Raleigh Beer Garden is also an achievement in design, with tables and bar tops fashioned from the oak and pecan trees that previously stood on the property. 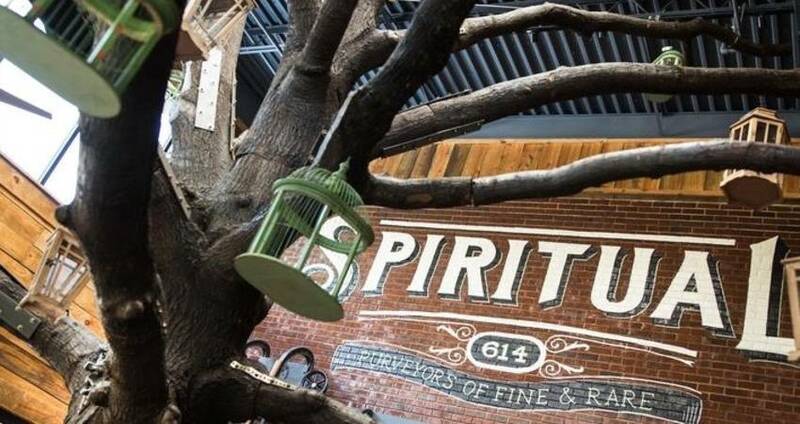 Trees are also utilized within the bar itself, adding an inviting element of nature to the interior, and also in the expansive biergarten patio outside. Inside, the lower level features a classic cocktail bar and a selection of 144 craft beers from N.C. on tap. Another 222 domestic and international beers are featured upstairs. On the menu are sandwiches, salads, burgers, wings, pizzas, crostinis, crab cakes and the best beer-battered pretzel this side of Milwaukee.